That the height of the saddle is correct for your leg length. Both Salli and Kanewell saddle stools offer a split-seat option with an open gap in the center of the seat. Most men and many women prefer this saddle desgin. The split-seat reduces genital temperatures up to 4°, which can be important for reproductive health and hygiene. The split-seat may also eliminate pressure to a man's pudendal nerve and prostate, which may improve sexual function. The Salli Saddle Chair has a split-seat option that is preferred by many men. The Bambach Saddle Seat has more anatomical contour, with a rise in the front (pommel) and a rise in the rear (cantle). The Bambach Saddle Seat is the most contoured of the saddle seats. The more anatomical contour in a seat, the more supportive the fit ... IF it fits. Problem is, the more contour a seat has, the fewer people it will fit. Seats with less anatomical contour accommodate a greater range of anatomical variations in the population. The Bambach Saddle Seat rises up in the rear of the seat. The rise is called a "cantle." The cantle helps support the pelvis in an upright orientation. Some folks really like the cantle and say they get tired without that extra bit of support, especially if they are not using a backrest. However, if you purchase a very contoured seat like the Bambach Saddle Seat, take care to purchase the correct size. If you use a contoured saddle that is too short for you (front-to-back), the front pommel may hit your "privates" which at best is uncomfortable, and at worst can compromise your circulation and become a health risk. If you sit with your knees wide apart, you will sit up straighter; If you sit with your knees closer together, you will slump. A common complaint of people new to saddle-sitting, is that the seat feels too wide. Saddle seats are wide by design. The wider the seat, the more stable and upright ones body posture. A wider stance also improves stability and safety for side-leaning and side-reaching movements. Those with stiff hips may be uncomfortable at first in a saddle seat. Typically, the hips loosen with time and the gentle stretching can be therapeutic. 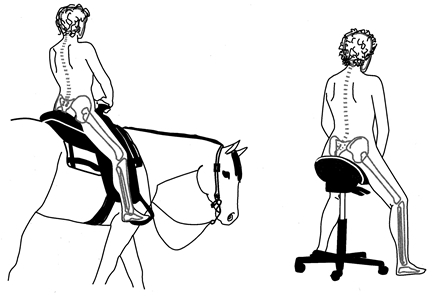 Some folks with hip arthritis report significant decrease in hip pain and improved function after progressive "therapeutic sitting" in a saddle seat. The Salli, Soma, Jobri and Kanewell saddle seats are just a bit wider than the Bambach Saddle Seat, although all are quite wide. All require hip flexibility to accommodate the width of the saddle. Compared to the Salli, Jobri, and Kanewell saddle chairs, the SomaSaddle and the Bambach Saddle Seat are soft. 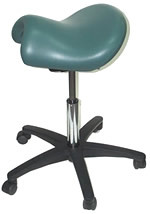 However, compared to conventional ergonomic office seating, all saddle stools feel firm. Some sense that the saddle seats are softly cushioned, while others complain bitterly that the same seats are too hard. Those who complain about hardness either have a seat that doesn't fit them, or they do not have sufficient tissue tolerance or flexibility to accommodate a saddle. It can take some people weeks or months to build up a saddle tolerance. Comfort in a saddle comes to all -- in time. That said, we have noticed that the longer one uses a saddle seat, the firmer one wants it! Note that firmness is less noticeable on an anatomically contoured surface. For example, a wooden bus bench is less comfortable - and feels harder - than a contoured wooden library chair, although their actual hardness is the same. Salli Saddle Chairs (e.g., Swing, SwingFit, Care, Sway) offer a continuous 360-degree seat motion. Some users prefer the continuous motion. Others prefer a seat that can be locked into place. Generally, the tilting seats that can lock into place, have greater tilt adjustment range than the continously tilting seats. In the Salli and Kanewell saddle stools, your feet are positioned almost directly underneath your body, while in the Bambach Saddle Seat, Jobri, and SomaSaddle your feet are positioned slightly in front of your body. If your hips are quite stiff, it may be more difficult to get your feet back underneath you, so keep this in mind when selecting your saddle contour. In all saddle seats, your feet actively contribute to your body support. The wide straddle stance forms a wide base of support for your hand tasks. This is quite unlike sitting in a conventional chair, where your legs do nothing to support your posture and are passively supported in front of your body. The Bambach Saddle Seat positions the feet slightly forward of the body. The Salli Saddle Chair positions the feet directly beneath the body. 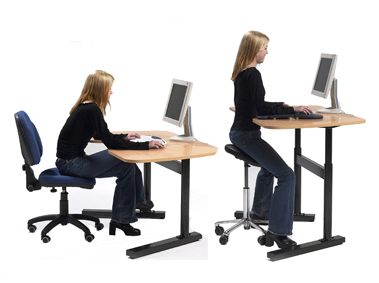 You will need to raise your desktop or hand-task several inches to work effectively in a saddle seat. Think of a saddle seat as a "supported standing device," rather than as a chair. Saddle seat heights are much taller than conventional chairs. When saddle-sitting one should have about a 135° angle between thigh and torso (vs. the 90° hip angle in a conventional chair). Seat height should be as high as tolerable Salli, Jobri, Soma, and Kanewell saddle stools, to insure ideal spinal postures. 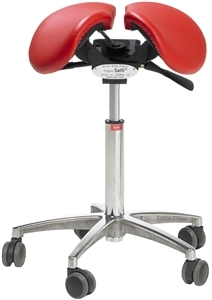 The Bambach Saddle Seat can be used a bit lower because its cantle shape helps to hold the pelvis upright even if seat height is a somewhat lower than optimal. That said, no saddle chair will support you properly if you use it at a conventional chair height. There are several inches of height adjustment range an individual can accommodate and still be safe, comfortable, and supported in a high perch posture in a saddle seat. However, if you adjust the seat too high you'll irritate your "privates," and if you adjust the seat too low you will slump and become uncomfortable in the saddle. Remember, all saddle chairs offer therapeutic benefits, even though they may fit and feel quite different. 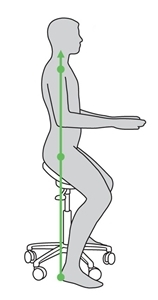 In all saddle chairs one "sits" or "perches" high, somewhere between sitting and standing, with the hips at about a 45-degree angle (as opposed to the 90-degree angle one assumes in a conventional chair. In reality, this is not a sitting posture. From a physiological perspective, it is really a supported standing posture! All activate the "core" postural muscles, including the abdominals, back extensors, buttocks, pelvic floor muscles, and the large muscles in the legs. 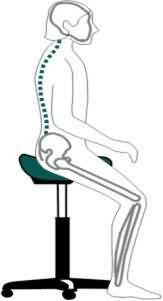 In contrast, in a conventional chair the core postural muscles are dormant. All increase lung volumes, as the wide hip position opens the chest cavity and increases diaphragmatic excursion. All improve acuity and strength for hand tasks, which is related to the recruitment of the postural muscles. All may require a period of adjustment during the first days/weeks of use, especially if you have become weak, deconditioned or stiff. Fit and flexible people feel at home in a saddle from the very beginning. Others must stretch and tone over time. All improve mobility and ease of navigation around the work area. All increase safe reaching distances. All improve postures and safety for forward reaching tasks. All position the spine in a neutral posture. All support good posture without a backrest or armrests. All improve balance because the wide straddle posture provides a wide base of support, and because of improved postural muscle recruitment. All improve circulation and reduce swelling in the feet compared with conventional sitting. In all honesty, the only way to know for sure which saddle seat will be best for you, is to try it on for size.